Enigmatic and reclusive bands start to become a staple of indie Canadian music if you spend enough time with it, tying in to our national inclination to avoid attracting to much attention to ourselves if we don’t have to. And while it can be frustrating if you ever want to know more about a band, it can also lead to some pretty creative side-stepping. 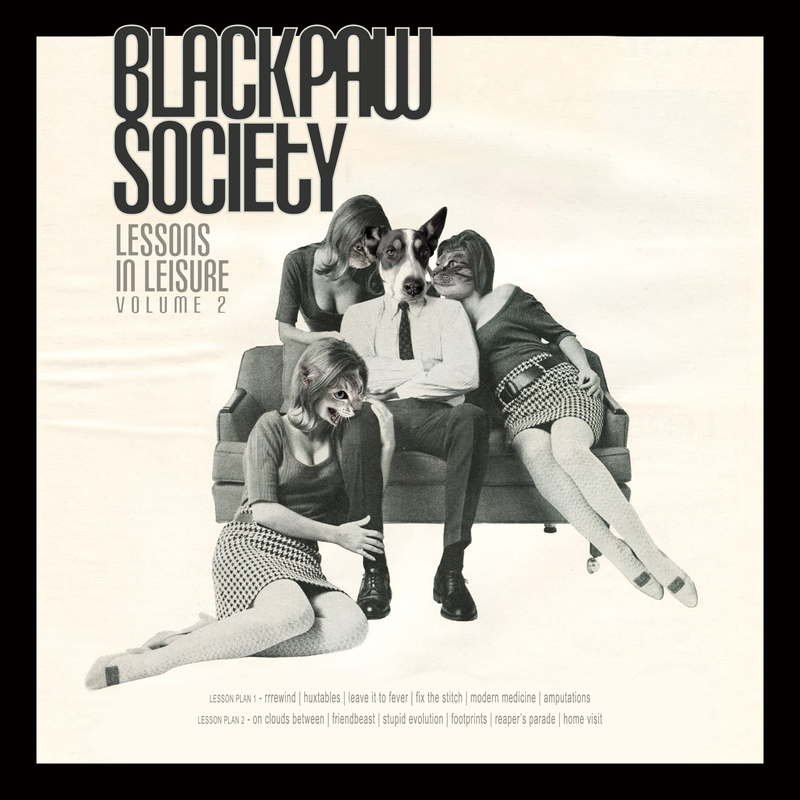 Blackpaw Society is one of Toronto’s mysteries—a “one-dog band” with “full-band albums.” Playing out that gimmick some more is the Mad Men-esque album cover for Lessons in Leisure Vol. 2 of a high-end business dog suffering the obvious pangs of ennui. Laughed off by the minds behind the project, there’s also a uniformity to Blackpaw’s masquerade—last year’s release, Rolling Around in Dead Things To Hide The Scent featured a Vetruvian-like werewolf on its cover. That might also be the reason for the obvious growl in the title of opening track “rrrewind,” capturing the sounds of a tape deck being flipped before diving into its poppy, synth-rock fusion. The pulsing beat falls underneath some whispy, lethargic vocals while picking up the pace with each new verse. The final 45 seconds of the song are some of the best on the album as they launch into an energetic finale of plaintive shouts over far too soon. But Lessons in Leisure Vol. 2 is the admitted creation of some turbulent times and this isn’t a standard poppy indie release by any means. With only a few exceptions, the album is an eerie, haunting and at times downright melancholic mix. Maybe it’s for those reasons that pluckier songs or segments stand out as a sign of what lies on the other side of Blackpaw’s latest inspiration. Still, echoing “modern medicine” taps into the softer side of grunge, monotone pop before easing back into the albums ethereal mix with “amputations.” There’s more rock to “friendbeast” as it calls out “the fear deep inside/when you know you’re going to die” with strong vocals that stand in contrast to everything before. And again, a final coda that plays the opposite end of the spectrum from the rest of the song solidifies it with a simple drum dusting. For all its subdued hues, Lessons in Leisure Vol. 2 is the perfect kind of dark and dreamy indie rock. Blackpaw Society always keep one foot rooted in the world, tapping into emotions and ideas that resonate while the album is peppered with grandiose moments that pull you back in if the dreams carry you too far away.